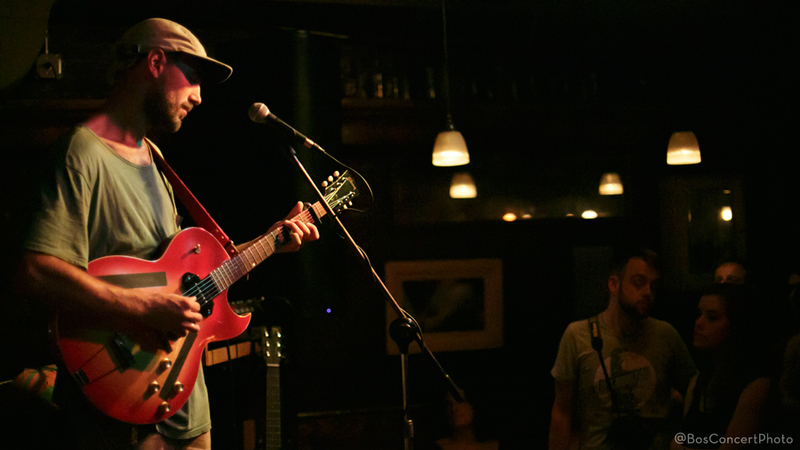 On Tuesday, July 28th Atwood’s Tavern played host to Nashville musician Rayland Baxter as he graced the stage of the intimate venue to share tunes from his forthcoming sophomore LP, Imaginary Man, out August 14th via ATO Records. Atwood’s (otherwise known as Little Nashville) regularly showcases some of Music City’s finest artists, and Baxter was back in familiar territory when he stepped up to the microphone with a quip on how his van broke down on the way to Newport. The first song of the evening was the beautifully haunting number, “Bad Things,” from his 2013 EP ashkeLON, and the capacity crowd roared with approval as the first notes of the song were played. Sure he has a new album on the way, but this musician knows how to reel in the audience on the first line out. Baxter pulled us all on board Imaginary Man with the next song, “Mr. Rodriguez,” which he has been playing live for a few years now under the title “Me & Mr. Rodriguez.” He and his fantastic band have it honed to perfection. In fact that statement rings true for the entirety of the evening’s performance. With a wide collection of songs to choose from off the debut album, feathers & fishHooks, the above mentioned EP, as well as the new material, Baxter and band wove tails of heartache and loss beautifully together with songs of hope and redemption. The new single, “Yellow Eyes,” is a standout track, a hopeful-heartbreaker if you will, and unsurprisingly those in attendance already knew the words. A scan of the crowd during another new song, “Rugged Lovers,” saw couples with arms around each other, quietly singing along as if they were being serenaded in their own living rooms. Rayland Baxter has only been on the scene for a little over 5 years now, starting it all off with fellow Nashville musician Caitlin Rose back in 2010, and it is obvious the impact his music has already made, seeing as how he can roll into a Northeast town on a Tuesday night and pack the place with fans who know all the songs on an album that was yet to be released. Here’s to hoping we see you at Newport Folk Festival next year Rayland! Providing your mode of transportation successfully delivers you and the band to your worthy destination. Check out the great photos and videos our very own Steve Benoit of Boston Concert Photography took of the show below. Although this tune debuted on NPR last week, it caught my ears again and I felt like I had to share it. It may be one of the best songs we hear this year, with it’s songwriting wit, it’s honeyed melodies, and its ability to slow down time I just couldn’t resist. The music reverberates inside your brain, it’s calming, introspective, and you just wish like a sunny breezy day, that it’d never end. The song elicits an absolute response and it’s the perfect jumping off point for his upcoming record, Imaginary Man, which drops August 14th on ATO Records. Jim James [S]aturday at the Folk Fest brought back the sunshine and another full day of incredible music. The day started early with the welcoming sounds from Mariachi Flor de Toloache. We then jumped into catching sets from RayLand Baxter, Jim James, Father John Misty, Sarah Jarosz, Shovels & Rope, The Low Anthem and the high energy of Trombone Shorty. The evening was capped off by Jay Sweet giving a warm welcoming return to The Avett Brothers. Check out day number two in photos from our photographer, Jamie Reiley, and let us know which show you most enjoyed.